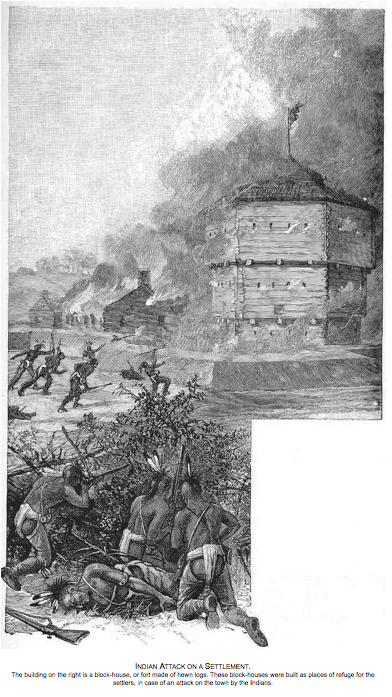 In 1676, at the height of King Philip's War, the war leader of the Wampanoag used a ruse to lure away the bulk of the colonial troops to the north. 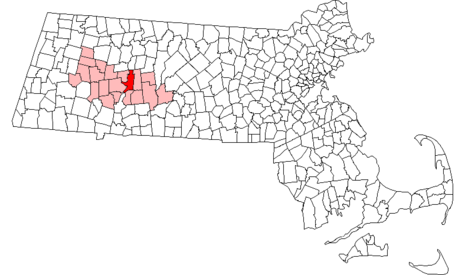 Without the protection of professional soldiers, the natives then prepared to attack the lightly defended town of Hadley, Massachusetts. However the settlers discovered the plot and despaired for their lives knowing they lacked any military expertise. But with all hope seemingly lost, a white-bearded man with a powerful bearing and wielding an old sword suddenly appeared. He raised and organized a town militia before leading them to victory against the superior numbers of Wampanoag. He then disappeared. Restoration authorities suspected the man to be the Puritan General William Goffe, still wanted for his role in the regicide of Charles I in 1649. Many of the co-signers of Charles I's death warrant had been executed or given life imprisonment upon the Restoration in 1660. In absentia Goffe had been sentenced to be hanged, drawn and quartered but he had escaped and fled to New England. Puritans made up a large section of the population in the New England colonies, there were many sympathisers who were prepared to protect Goffe. Some of his surviving letters give vague clues about the locations and the general areas where he was hiding. Goffe is believed to have stayed in the house of Hadley’s minister, John Russell. 4. If the leader was William Goffe, he was no longer in Hadley. * Whether General Goffe ever led Hadley’s forces. As a matter of history, it may not be possible to demonstrate whether the story of the Angel of Hadley is either true or false. Material evidence appears to be, at best, scanty. The legend has no supernatural elements or outright impossibilities (if the “appearance” were simply emerging from a hiding place). Each character has a plausible motivation; the “Angel” to use his military expertise to save the town (and his own life); the townspeople to protect their savior from subsequent investigations. As a legend, the Angel of Hadley has several powerful elements: a small town in peril, a mysterious stranger hiding from an oppressive King, a victory, a disappearance, a Rashomon-like disagreement in accounts given to outsiders. As a legend, it may have furnished ideas used by Sir Walter Scott in Peveril of the Peak and by James Fenimore Cooper in The Wept of Wish-ton-Wish. It is also a likely source for "The Grey Champion", a Nathaniel Hawthorne short story that features an elderly Puritan man who brandishes a sword in defense of his people. At Hadley, the people were in the meeting-house when the terrible Indian war-whoop rang through the village. The savages drove back those who dared to go out against them, and it seemed as if the village must be destroyed. 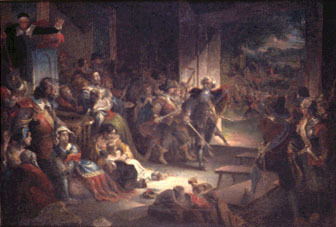 Suddenly a white-haired old man, sword in hand, appeared among the settlers. No one knew who he was; but he called to them to follow him, as a captain calls to his men, and they obeyed him. The astonished Indians turned and ran. When, after all was over, the whites looked for their brave leader, he had gone; they never saw him again. Many thought that he was an angel who had been sent to save them. But the angel was Colonel Goffe, an Englishman, who was one of the judges who had sentenced King Charles the First to death during a great war in England. He had escaped to America; and, luckily for the people of Hadley, he was hiding in the house of a friend in that village when the Indians attacked it.